How Do I Choose the Best Pancake Pan? Pancake pans should have shallow sides and a flat bottom. Choosing the right pancake pan can make a big difference when making this popular breakfast dish. You'll want a pan with a flat bottom to allow the pancakes to cook correctly; shallow sides and a non-stick surface can help you flip them more easily. Don't skimp on quality when buying a pancake pan, because it will usually pay for itself in terms of usage, dependability, and durability. A wide, flat pan allows you to prepare pancakes of many different shapes and sizes, and lets you do so in the same pan at the same time without them running together. 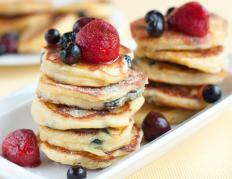 The flat bottom also helps the pancakes to cook properly; the batter should spread when cooking, and if it cannot do so evenly, you may get cakes that are underdone in parts. Low sides allow you to slide the spatula under the pancake and flip it cleanly, creating less mess. For very large cooking jobs, you might want to use a pancake griddle, which is usually larger than a standard pancake pan. Choose a pancake pan that is versatile, and can be used on many different cooking surfaces; a good quality pan should be able to be used on either a gas or electric stove. One advantage of buying a high quality cooking pan is that it should be able to withstand the high temperatures of a gas stove, while a light, cheaply made pan might not. Cheaper pans are also more likely to heat unevenly, meaning that your pancakes might not all cook to the same doneness at the same time. Whatever pancake pan you choose, it usually best to keep the heat to medium to prevent the pancakes from being burned on the outside and raw on the inside. A problem many people encounter when cooking pancakes is sticking, which can not only cause them to burn but can also make them look unappetizing. Many people prefer a pancake pan with a non-stick coating; however, with the proper seasoning and oiling techniques, this isn't a requirement. Keeping the heat relatively low and brushing a thin coating of butter onto the pan before cooking your pancakes can make them easier to flip and remove. Specialty pancake pans are one way to make pancakes more fun, especially for children. It's possible to find pancake pans shaped like everything from hearts, to stars, to footballs. There are also pancake pans available in seasonal or holiday shapes, like Christmas trees, pumpkins, and four-leaf clovers. Is Kansas Really "as Flat as a Pancake"? What Are the Best Tips for Making Low-Fat Pancakes? How Do I Choose the Best Pancake Ring? How can I Make Pancakes? @raynbow- I recommend a pancake pan that is made of anodized aluminum. This material is safe to cook on because the aluminum is locked inside a secure core. The non-stick coating is not made of harmful chemicals like that of over types of cookware coatings, so this is a benefit for people who like to cook. What is the best type of non-stick pan for making pancakes? A smooth surface that allows them to glide out of the pan is essential for perfect pancakes, but I'm concerned about the chemicals that are in some types of non-stick surface coatings.